Found an interesting scenario in the Wowhead datamining. According to it, the Horde will also get a unique scenario that involves SW and the Stockades, and the Alliance will have one involving the Siege of Lordaeron, though I suspect the Horde will get something for the latter. I'm getting so hyped for this expansion, I hope some more creature models are revealed soon in the datamining. One of my personal favourite things so far is this demonic baby goat. I have a feeling it'll be a minipet, possibly from the store like Argi, but either way I simply must have it. Looking through the strings of data on wowhead, I'm thinking that BfA might be much further along than we think. There is already a list of achievements for Mythic dungeons, which I don't think Legion had at the beginning of Alpha/Beta. There's been some rumours (which I'm taking with a big pinch of salt) that pre-order might go live on Tuesday. I'm highly skeptical, but man we really do seem to be far along and I'm dying to get my hands on the allied races. I'd be thrilled if that's the case and we can get early access to some of them. I'll keep my fingers crossed but try not to get my hopes up. I've heard the same! I wouldn't be surprised, since practically all of the data is in the Live game for the first four of the Allied Races. Blizz really just needs to flip a switch to turn them on. Now, we may not get to play them on Tuesday, but I will be very surprised if Pre-Orders aren't announced during the Q and A, and a date is given for when we can play Allied Races. Wow, it looks like professions are getting squished! The max cap is now 100! Though it could just be due to the stat squish, it seems BM is getting nerfed. :/ Though, bear in mind, this is very early on in the Alpha, so things will change. Murder of Crows is being nerfed from 162% of AP to 34.02%. Aspect of the Beast. Ferocity's bleed is being reduced from 270% of AP to 56.7%. Bestial Fury is being removed. Binding Shot no longer stuns. Dire Frenzy's Focus generation is being reduced from 24 to 20 over 8 secs. Disengage's movement speed is being reduced from 60% over 5 secs to 50% over 4 secs. It looks like Pterrodax might be the next Netherwing/Cloud Serpent faction. Zandalari Dinosaurs may just be an internal faction that we normally can't see. 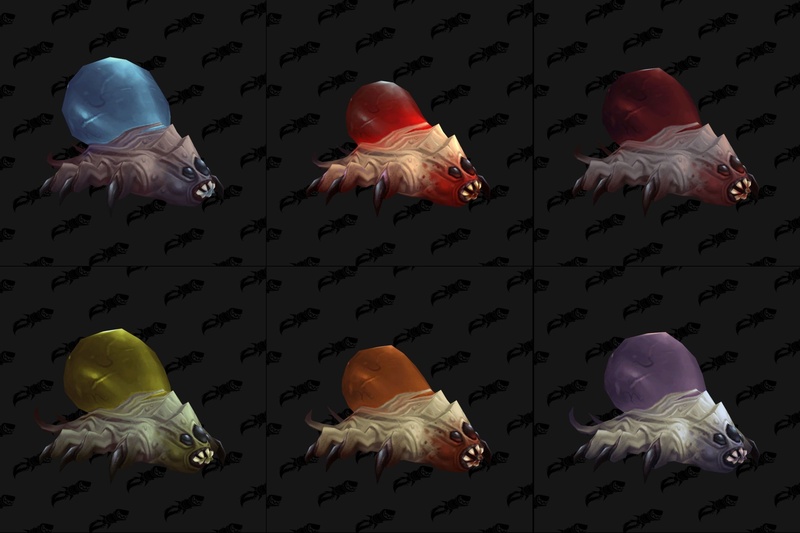 Wowhead just added a ton of new creature/mount models! I'll just link the page, there's too many! Also the turtle dudes from Hearthstone! I don't like the beast mastery changes at all. Survival changes are good. But BM just look unfocused and as if they still don't know what to do with them. This is clearly Ducky from Land Before Time! So with bee critters, bee mount and bee creatures. It kinda looks like we will have a full set of bee hunters! I really hope the bloodtick larvas can be hunter pets. Because just look at how amazing they are? I'm looking forward to the hive mind mount. I just saw there is a mail pirate hat! Acid Spit, Dust Cloud, Frost Breath, Furious Bite, Pin, Talon Rend, Tendon Rip Claw, Warp Time, and Web Spray all slow movement by 50%. Infected Bite, Monstrous Bite, Ravage, Savage Rend, and Toxic Sting reduce the effectiveness of any healing received. Nether Shock, Serenity Dust, Sonic Blast, Spirit Shock, and Spore Cloud remove [*25% of Spell Power*] Enrage and 1 Magic effect. Bristle, Obsidian Skin, Shell Shield, Silverback, Thick Fur, and Thick Hide reduce damage taken by [*50 + 25% of Spell Power*]. Catlike Reflexes, Serpent's Swiftness, Winged Agility, and Dragon's Guile increase dodge chance by 30%. Ancient Hysteria and Netherwinds Increases haste by 30% [*30 + 25% of Spell Power*]% for all party and raid members for until cancelled. Prowl and Spirit Walk Puts your pet in stealth mode, but slows its movement speed by 50%. The first attack from stealth receives a 20% [*20 + 25% of Spell Power*]% bonus to damage. Molten Hide When the core hound takes melee attacks, it infuses its hide with molten lava, causing [*50% [*10.5% of Attack Power*] Fire damage to all further melee attackers for until cancelled. Only few abilities are use for a dps increase, while the rest are based around slowing, removing a buff, decreasing healing, or reducing damage. I do not know many NPCs that heal during a fight or need to be slowed from running away; however, I know this would come in handy against enemy players, which seems to be the focus of these abilities. I think Blizzard is hoping BfA will bring new life to PvP and putting that focus on our pets. A lot of the original Pet abilities had no real raid application, at least most of the time. However, I think we were just hoping for families to have unique abilities again, not necessarily for them all to have regular usage.